Trail Ride socks is simple, top-down sock project. 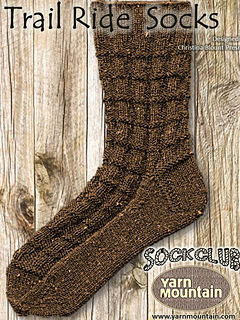 The pattern is a 6-stitch garter knit and purl combination that creates a versatile unisex textured sock. This pattern incorporates the Garter Edge Heel, first developed by Elizabeth Zimmerman, for an easier custom fit. The pattern is written for a medium women’s shoe. It can be adjusted for different sizes by increasing or decreasing 6 stitches at a time, or by adjusting the needles size to suit. The leg length is 7-8”, which can also be adjusted to suit individual preference by adjusting the number of pattern repeats.